Data are available for download here. To use them, please cite the corresponding publication : " Collon P., Pichat A., Kergaravat C., Botella A., Caumon G., Ringenbach J. claude, Callot J.P. (2016). 3D modelling from outcrop data in a salt tectonic context : Example from the Inceyol mini-basin, Sivas Basin, Turkey. Interpretation, InPress, 1–47." A 3D geological model of the Inceyol mini-basin was built thanks to a subtle combination of various techniques available in RING's plugins : VorteXLIB for vomumetric meshing, StructuralLab for implicit modelling using various constraints and weights, and Gopy for automation of Surface extraction. Located on an ancient salt extrusion, the Inceyol mini-basin is approximately 700 m wide by 800 m long. It is filled by more than 300 meters of saline lacustrine to sebkhaic deposits of Oligocene age. The mini-basin is structured as an encased system of synclinal folds displaying an elliptical shape in overall outline. In more details, the mini-basin forms a single syncline in the north that splits to the south into two individualized tight synclines. The two synclines are separated by an exposed gypsum wall, interpreted at depth as a weld or a thin wall. At the outcrop, both sides of the salt wall are marked by steep to overturned flanking strata. 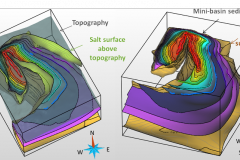 The resulting 3D model highlights the remarkable geometry of this salt-tectonic related structure and underlines the usefulness of new modelling methods to ease a more automated generation of such tectonic features. This work has been presented by Pauline Collon in the French symposium RST2014 in Pau (France) and in the EGU General assembly in Vienna (Austria) in April 2015 (abstract here). It has just been accepted for publication in the peer-reviewed journal Interpretation.